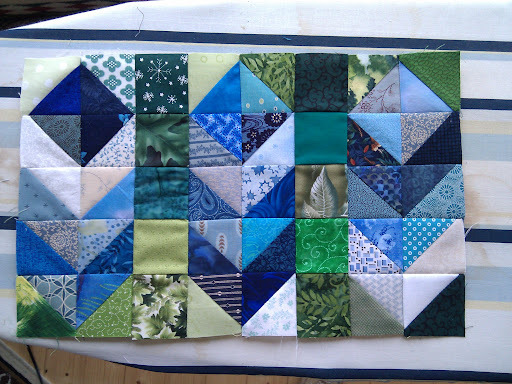 I've been making slow but steady progress with MT quilts this week. I've started piecing Texas Mom's quilt. It's the 4 seasons quilt. I've started with spring - bluebonnets. If you've ever been to Texas in the spring you've seen field upon field of those beautiful flowers, purple blue as far as the eye can see. I'm not sure if mine look quite right but my husband thinks they're fine. What do you think? Beyond that, I'm over halfway done with hand sewing the binding down on Pop-Pop's quilt. I love the vibrant turquoise blue against the brown and green - it makes it look so bright! You will have pictures of it as soon as it's done. One other thing - my husband will be home from his business trip next week! I've missed him so much. Do any of you have suggestions as to what sort of foods I should make to celebrate his homecoming? I'm running a bit low on food ideas. I love the colors in the quilt! Beautiful work.